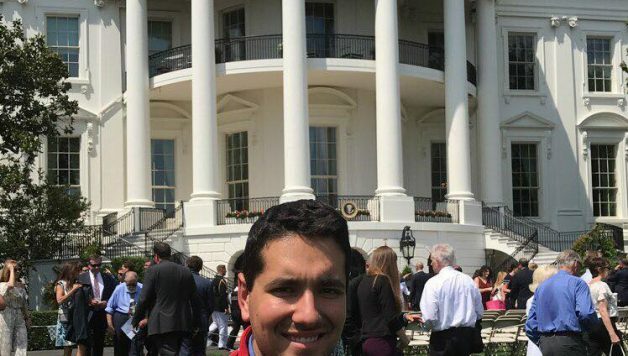 Trackside with Dominic Aragon: Representing New Mexico in Washington D.C.
On May 21, the White House honored NASCAR champion Martin Truex Jr., and I had a front-row seat to the celebration. Well, it wasn’t front-and-center, but I was as close as the Secret Service would let me. I was one of seven reporters from the NASCAR corps there to cover the event. 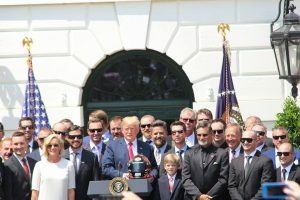 I was initially there for The Racing Experts, and it was neat to have our managing editor, Matt Courson, and myself there on the White House’s South Lawn. Our group of reporters and photographers stood on a riser, about 40 feet away from the Commander-in-Chief, Truex and his girlfriend, Sherry Pollex. 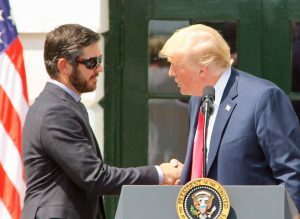 President Donald Trump spoke about a few topics including Truex’s efforts in 2017 that propelled him to the title, and the personal battles Pollex had overcome with cancer. After booking last-minute airfare to fly into Charlotte, North Carolina, an eight-hour drive awaited our crew en route to D.C. on Sunday night, May 20. 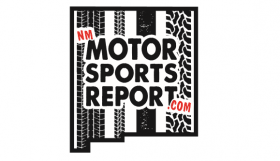 Matt and I carpooled with The Motorsports News Source’s Christian Koelle to the event. The last thing we expected was a bump in the road. Or in this case, a curb. When Matt struck a curb in the Raleigh-Durham area Sunday night and punctured the sidewall on his right-front tire, our trip and destination became uncertain. With locking lugnuts on all five studs and without the specific socket to loosen them, we were at the mercy of others to help us get back on the road. Matt’s Ford Fusion sat crippled in a Walmart parking lot, and we exhausted all avenues to try and get this problem remedied. Thankfully, an on-call mechanic helped our crew and had the specific tools needed to remove the lug nuts. We drove over 120 miles on a doughnut tire but got a replacement Monday morning at a Discount Tire shop in Richmond, Virginia. And yes, they threw in not one, but TWO lug nut wheel keys. Needless to say, this close call almost derailed the trip, but the clutch efforts of our mechanic at 1 a.m. saved the day. No matter one’s view on politics, it’s always an honor to be able to be in our nation’s capital and even more humbling to be in the presence of the leader of our country. 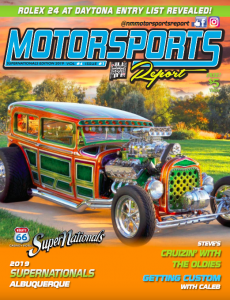 Plus, it was an excellent day for motorsports, to be given the stage and attention in D.C. It shows that our sport still has a large following, one that the White House acknowledges. From my knowledge, I was the only New Mexican covering the event across all media who were there. As someone who hails from Grants, it was cool to think I was representing our state in Washington. It is something I do not take lightly. Covering this event, to me, was just as big as covering a pinnacle race like the Daytona 500 or the NASCAR championship weekend. 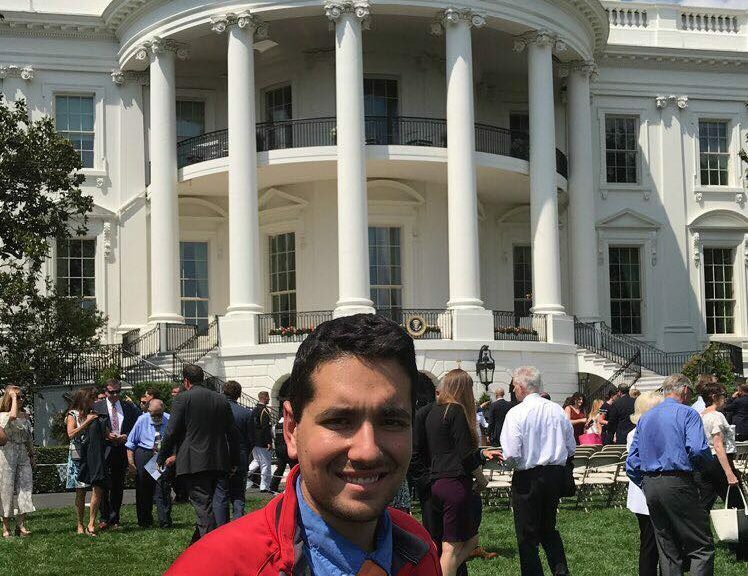 One Response to Trackside with Dominic Aragon: Representing New Mexico in Washington D.C.